Yesterday was the 4th annual Los Angeles Vegan Beer & Food Festival. Last year I was a volunteer, but this time around I wanted to roam around and enjoy the fest free of responsibility. My husband and I met up with some awesome friends and had an amazing time eating great food, drinking beer (full disclosure: I do not like beer! 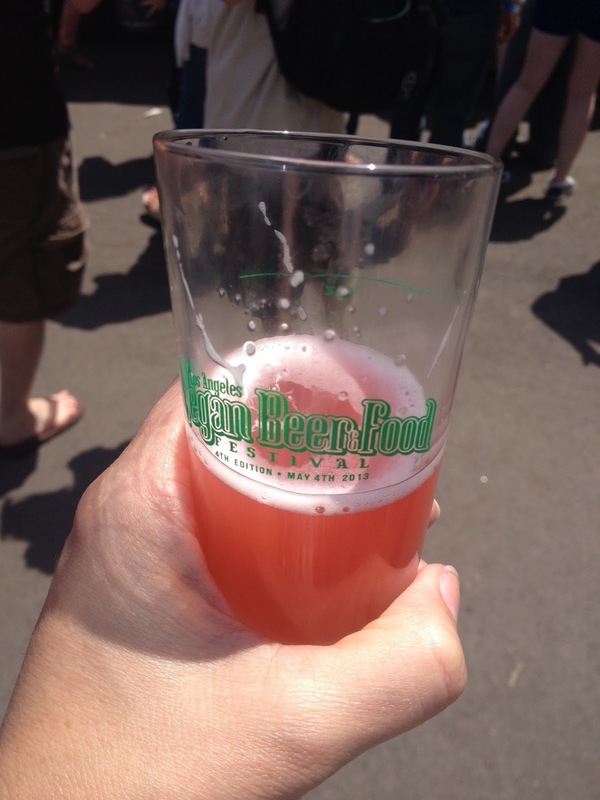 I tried a few and really didn’t like any of them except for the one cider I found and the kombucha beer), enjoying amazing music and meeting new people. My friends Jeremy & Lucy – that’s me in the middle. It’s so refreshing to attend an event where you know you can eat and drink everything there, no need to hound each vendor for their ingredient list. 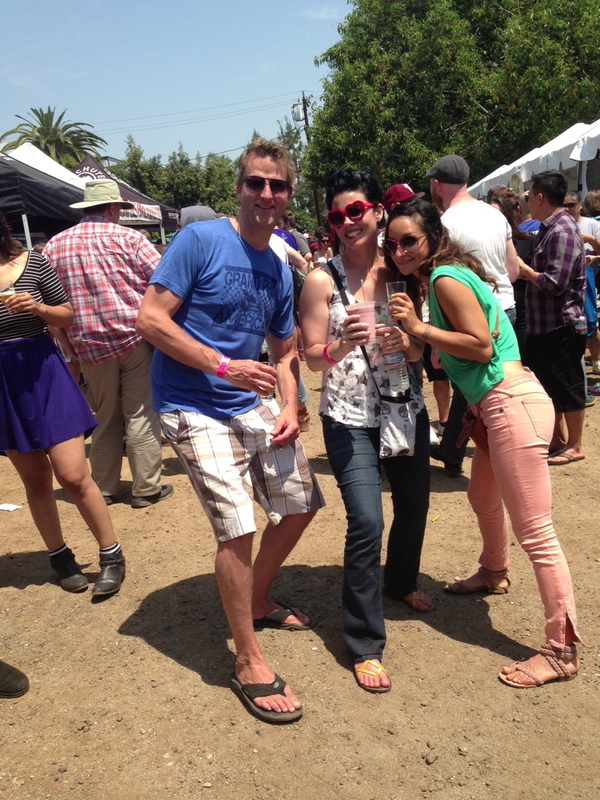 I would love to see more vegan events like this in L.A. throughout the year! 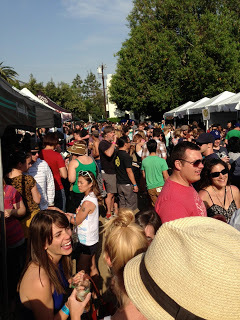 There were so many people – I love what a large vegan community there is in this city. On to the food! We ate so much, but only hit about half the vendors. 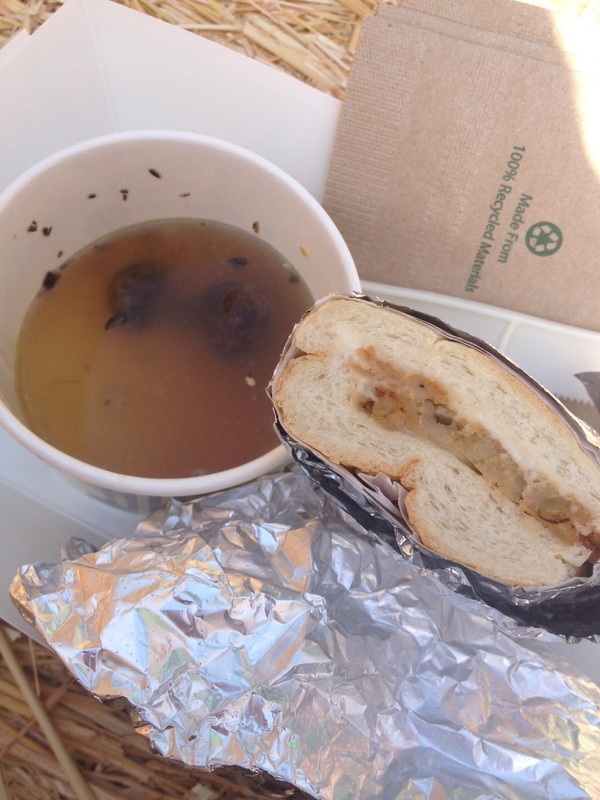 There was a lot of yummy looking food I didn’t get to try – it’s hard to pace yourself and still try one of everything! 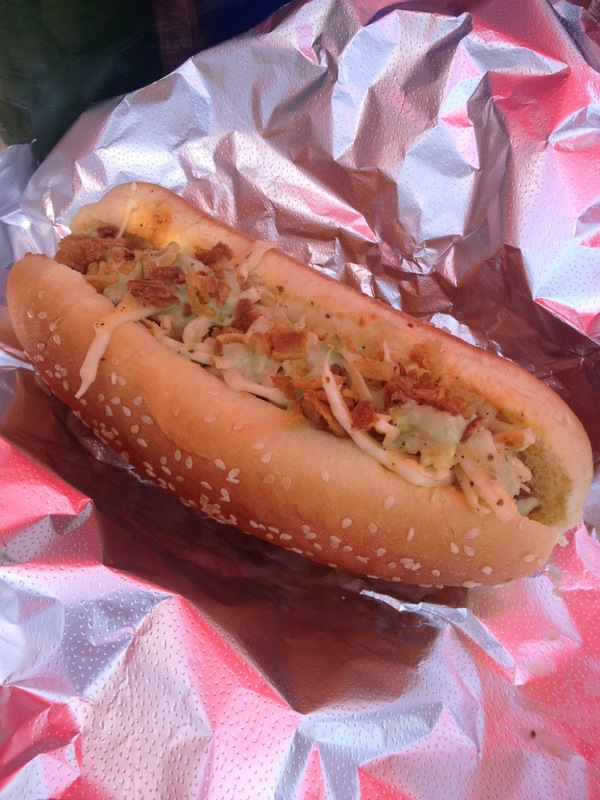 First stop, the Seabirds truck. 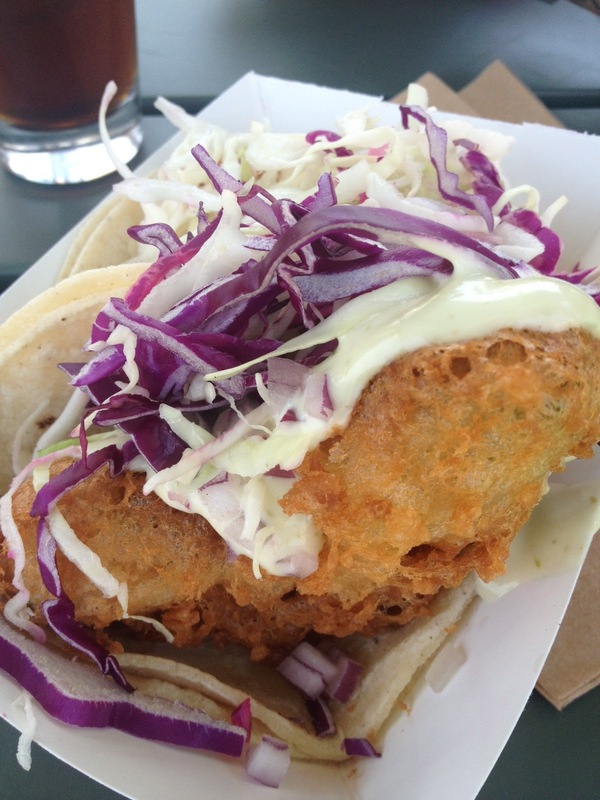 I knew the line for this one would get long so we ordered our Battered Avocado tacos right off the bat. Just as amazing as I remember them being last year! Certainly one of my favorite vegan dishes ever. Next stop was The Frankenstand – always a treat, great vegan hot dogs, but today we tried their special Cannibal sandwich. Super good – the green sauce was amazing. 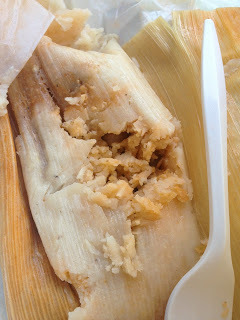 After a brief pause from eating, I moved on to some vegan tamales. These were made with soy meat and beans. It’s been SO long since I’ve had a tamale and this one definitely hit the spot! 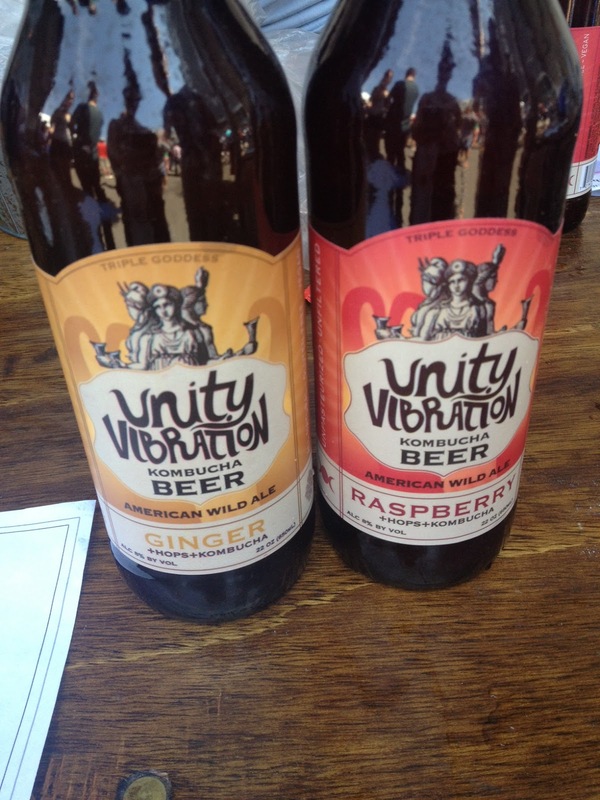 Sometime after the tamale and sampling numerous beers I did not like (nothing against the beer makers, I’ve just never been a fan of beer) – we came across the beverage highlight of the day (cue singing angels): Unity Vibration Kombucha Beer. I think I drank about 17 glasses of this stuff. It was light & refreshing. The raspberry was delicious, and the ginger was a perfect way to settle my stomach so I could get back to eating more stellar vegan food. Plus – it’s gluten free! After waiting in a line that did not move for 20 minutes hoping to get some jambalaya, we gave up and went to Tony’s Darts Away for a seitan french dip sandwich. The au jus was to die for! 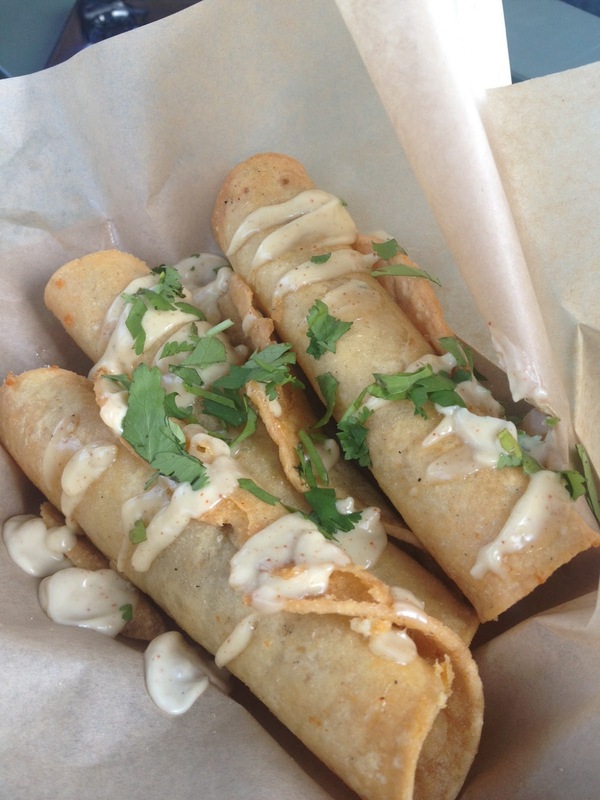 Couple more glasses of kombucha beer later, we went back to Seabirds for potato & cheese taquitos. Super crisp and tasty, though not as fantastic as the avo tacos. I could live off the creamy sauce they were topped with. There were also some french fries from Fresh Fries and a dynamite roll from Shojin consumed during the day but I forgot to get pics of those. Overall the day was a mad success and I cannot wait until next year! 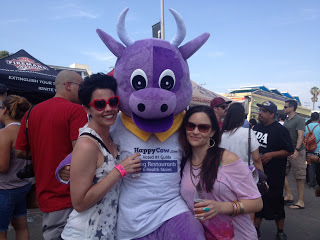 My friend Melissa and I even got to meet the Happy Cow!! **The one drawback of this year’s fest was the bathroom situation. I’m not a fan of porta-potties, but I will use them in dire situations. Unfortunately there was no water in the hand washing stations every time I checked throughout the day and no way was I going to use the bathroom without being able to wash my hands after 🙁 There was also a massive line most of the day. I know this year was the biggest turnout they’ve had, so hopefully next year they will improve on that.